Por órdenes del Gral. 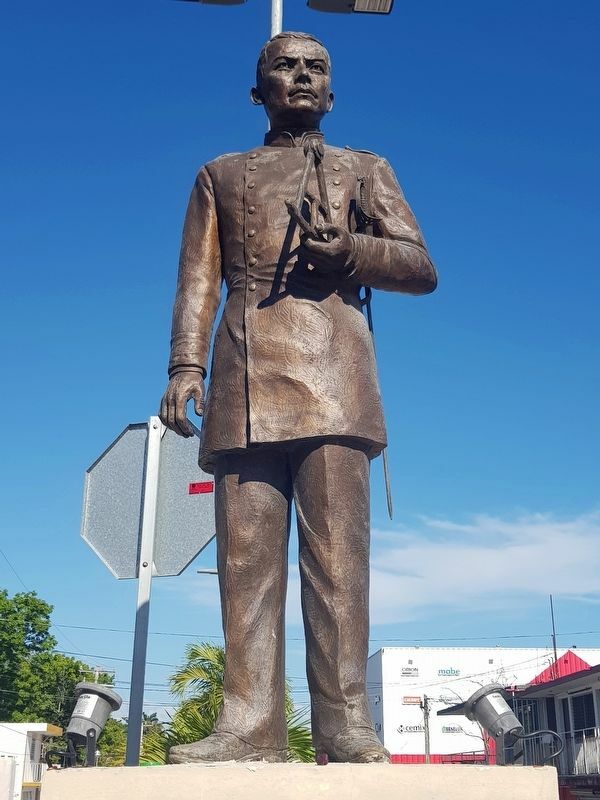 Porfirio Díaz en 1895 fue designado comandante del Pontón Chetumal con el objetivo de establecer una aduana, ejercer la soberanía en la desembocadura del Río Hondo, y fundar la población de Payo Obispo hoy Chetumal. 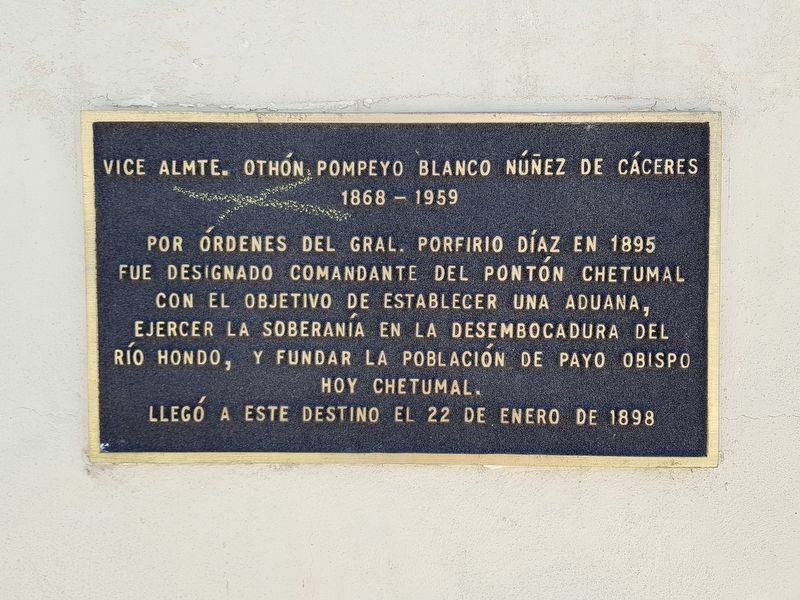 By orders of General Porfirio Díaz in 1895 he was appointed Commander of the pontoon boat “Chetumal”, with the objective of establishing a customs office and exercising sovereignty at the mouth of the Río Hondo River. He was also ordered to found the town of Payo Obispo, known today as Chetumal. He arrived here on January 22, 1898.
north on Avenida de los Héroes. Touch for map. 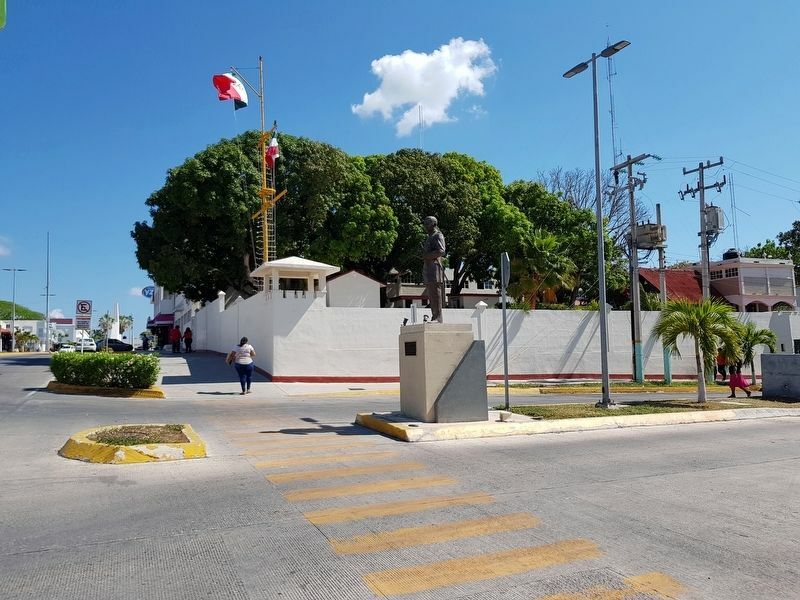 Marker is in this post office area: Chetumal, Quintana Roo 77000, Mexico. Touch for directions. Other nearby markers. At least 8 other markers are within walking distance of this marker. Avenida 5 de Mayo (a few steps from this marker); Belisario Domínguez (within shouting distance of this marker); The History of Chetumal: 1940-1950 (within shouting distance of this marker); La Calle del Relox (about 90 meters away, measured in a direct line); The History of Chetumal: 1960-1970 and 1970-1980 (about 120 meters away); Manuel Ignacio Altamirano Market (about 150 meters away); Allegory of Mestizaje (about 210 meters away); The Morelos Maternal and Children's Hospital (about 240 meters away). Touch for a list and map of all markers in Chetumal. Regarding Vice Admiral Othón Pompeyo Blanco Núñez de Cáceres. The efforts of Vice Admiral Blanco were part of the overall strategy of the Díaz government to end the Caste War, a 54-year long war against the indigenous people of the Yucatán. More. Search the internet for Vice Admiral Othón Pompeyo Blanco Núñez de Cáceres. Credits. This page was last revised on March 31, 2019. This page originally submitted on March 30, 2019, by J. Makali Bruton of Querétaro, Mexico. This page has been viewed 45 times since then. Photos: 1, 2, 3. submitted on March 30, 2019, by J. Makali Bruton of Querétaro, Mexico.